The wildest shopping in Las Vegas, reviewed by Las Vegas Visitor - insider reviews of restaurants, casinos, attractions, and online shopping for Vegas gifts and collectibles. The name of the game here is "outrageous". Las Vegas has a whole lot of shopping malls. That's how this town was set up from the get-go. Most of them are very mundane with your Kohl's, WalMarts etc. But a few of them are head and shoulders above the rest. Las Vegas Visitor has a list of them here In fact, Las Vegas actually has the highest grossing mall in the nation. Read on and find out which one it is. Not too many of those around. This place is huge and has everything you may want for the outdoors. It is inside the Silverton Hotel. They list their address as 8200 Dean Martin Dr. You are better off to take the I15 S and turn off onto the Blue Diamond Rd. It can't be missed, it is pretty large. Look for the Silverton Hotel, they have a large marquee. 702 730 5200. www.basspro.com. Here is a list of the shops:Bellagio At Home, Chic Affairs, Via Bellagio, Bellagio Lobby, Via Fiore Pool Promenade, Cirque Du Soleil Store, Richard Macdonald, Jean-Philippe Online. 140 stores, food court, kids' carousel area. 10 a.m. - 9 p.m. Monday-Saturday, 10 a.m. - 6 p.m. Sunday. More like an average mall. I noticed a lot of tourists here, that is why I am listing it. It is very easy to reach, just take one of the double decker buses going south on the strip. They drop you right in front of the mall. PUBLIC TRANSPORTATION The Deuce - Las Vegas Blvd (Strip) Transportation The double-decker Deuce buses operate along the Strip with a convenient stop at Fashion Show. Customers heading north along the Strip should disembark at Wynn Las Vegas and cross over to Fashion Show. Customers heading south along the Strip can disembark at the Fashion Show stop located in front of the center. This mall has a lot of real nice stores and a few art galleries. Services Fashion Show features the following services and amenities:ATM Copy/Fax Service, Family Restroom, Free Wi-Fi, Local Attraction Ticket Sales, Local Attractions Visitor Info, Lost and Found Mall, Gift Cards, Postage Service, Soft Seating Area, Stroller Rental, Taxi Services, Transportation Schedules, Valet Parking, Wheelchair Rental. A small shopping area, nothing special really. A gift shop with the ubiquitos las Vegas plunder. A bar, a coffee house, and a couple of other stores. Not worth the trouble. It really should not be on this list. 100 upscale shops (most of them anyway). Some very nice restaurants. Free entertainment too. Mall Hours: Friday to Saturday 10am - 12am Sunday to Thursday 10am - 11pm. The big names are all here. 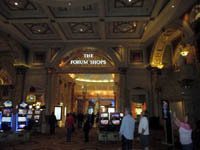 And the mall is center strip, adjoining Caesars Palace.It is not just shopping, but also fine dining and entertainment. THIS IS ALLEGEDLY THE HIGHEST GROSSING (PER SQ. FT.), MALL IN THE U.S. I belief it, I have been there quite a few times. 100 stores and a large food court. This is more like a neighborhood mall for locals. 11 a.m. - 6 p.m. Sunday. Too far away, really, for the average tourist to Las Vegas. Specialty shops and restaurants along a replica of the Grand Canal in Venice (Italy), also the Plaza San Marco. An eclectic mix of business and entertainment. This one has so many shops and dining venues it will take this whole page to post them all. Just go there and see for yourself, it is well worth it. From the Venetian you can walk to the Palazzo and the Sands Convention Center without ever setting a foot outside. Both of these hotels have something that is unusual in Las Vegas - poor parking. Especially during convention time. I solve that problem by parking at Treasure Island (free parking), and walking across the street. Just opening this year (2014). A very pleasant mix of shopping and entertainment. 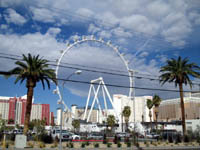 The Linq is anchored on one side by a giant Ferris wheel, the largest in the world. Really amazing. I got some pricing of $35 I believe. That would be a bargain for what you get. Linq also has a Brooklyn Bowl. It is a clone of the one in New York. I have never seen anything like this. It is a giant bowling alley, concert venue and dining place all in one. Truly astounding. There is a Yard House Bar. I checked the beer list, 138 different ON TAP!, plus a few (6?) brewe in - house. The Linq is in the former alleyway next to the former (now the Quad), Imperial Palace, just north (walking distance) of the Flamingo. The shopping here is not outrageous, just very eclectic, That's why it is on this list. Hey, there is a new mall in town. I know,we needed more shopping. This one connects the Mandalay Bay hotel with the Luxor hotel via a fly-over across the street between the two hotels. Enter at either one of the hotels by taking the escalator to the second floor. Expect upscale and pricey but rather pleasant actually. 6605 Las Vegas Blvd S, Las Vegas, NV 89119 (702) 269-5000. This may not be real outrageous, but it is heads and shoulders above the average shopping mall. Easy to reach too. Only about two miles from center strip. Lots of shopping, dining and just strolling and people watching in an upscale outdoor setting. Lots of free parking too.It is a well balanced blend of shopping, dining and entertainment, well worth a visit. Way better than the Belz listing above.